Touchco, a New York start-up, had hit the Internet and has gone with its low-cost resistive multi touch solution. Except for Touchco, Stantum is still actively doing its business. Today, I introduce another resistive multi touch company – Sima Systems. Below are the introduction of its MT/MF technology. SiMa Systems is a pioneer of Multi-Touch and Multi-Force (MT/MF) touch sensor technologies. SiMa’s resistive MT/MF touch technologies have unique functional characteristics enabling a new dimension of touch, gesture and pen input. Resolution of up to 20 points/mm affords uncompromised accuracy even for the most demanding applications. SiMa’s touch technologies can be integrated into a broad range of products from displays to touch pads. SiMa’s touch technologies are packaged and delivered in a patented Terminal Interface Chip and Firmware licensing. OEMs, Systems Integrators and Developers use SiMa's technology to create "X-wire" (as opposed to 4-wire or 5-wire) resistive touch surfaces. Multi-Touch — The ability to recognize multiple and simultaneous touch points. Capable of recognizing ten or more simultaneous touch points at 1,000 updates per second. Multi-Force — The ability to measure the “z axis”. This allows the user to locate a point without activating it, then, by exerting slightly more pressure to actually activate the point. There is no need to lift fingers and retouch. Dynamic Home Row — Allows the user to touch the sensor without looking at the display or pad, and intuitively the sensor understands the purpose of the gesture (i.e. typing, commands). The sensor can be programmed for virtually any manner of touch and gesture input. High Resolution — The resolution (points/mm) remains constant regardless of sensor size. Auto Calibration — The touch sensor self calibrates with each touch providing optimal point data at all times. Standard Materials and Processes — Same materials and manufacturing processes as those used for standard resistive sensors. 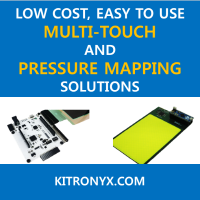 This provides a proven and stable means to implement SiMa’s touch sensor wherever standard resistive sensors are now deployed. Before wrapping up, I briefly note each company’s technology. Although their technologies are similar to each other, each has its own unique characteristics. Touchco’s IFSR technology is mostly about algorithms to increase sensing resolution and improve accuracy. IFSR system is flexible, thin, and possibly transparent. Touchco has demoed an e-paper integrated system. It also has showed off a transparent version, which is not technically validated by integrating with existing LCD or OLED displays. Stantum’s PMatrix is already market-available and can provide resistive multi touch screen. Stantum has also introduced a Slate PC employing its PMatrix technology. SiMa systems’s MT/MF technology is based on the unique resistive X-wire multi-touch relatively unknown but it seems to be that is an advanced version of conventional resistive technology and might be compared with Stantum’s PMatrix technology. Below is a multi-touch demo of SiMa’s MT/MF technology (Resistive X-Wire Multi-Touch) found in the company brochure.